The main idea and concept is to start from a central topic and branch out – grouping together all your associated ideas and thoughts. This lets you see and explore what’s in your mind and discover new ideas and relationships. Basically all you need for creating a mind map is pen and paper. However, there’s some excellent computer programs available to help you create digital mind maps. You can use mind mapping for any area in your life. 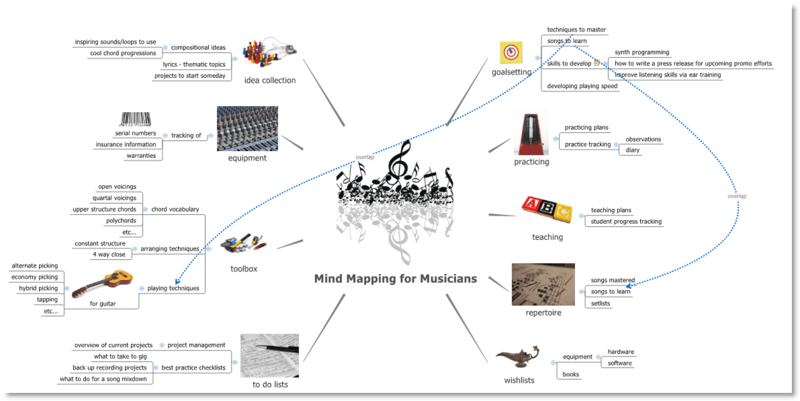 I’d like to make some suggestions where and how mind mapping can especially come in handy for musicians. 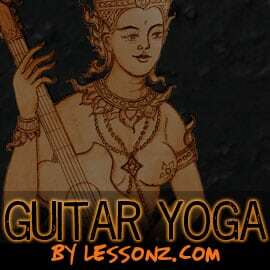 Did you stumble upon a new chord progression that you want to build a song around? Did you come up with a killer line of lyrics that you definitely have to remember? What about the new project idea that you want to present to your band members? Any time you have a music related thought or idea, track it in your master idea collection mind map. It’s out of your head and stored, plus you might find connections you maybe would NOT have thought of otherwise, e.g. combining the killer lyrics line with the newly discovered chord progression. A mind map can be extremely helpful in developing a meaningful personal practice plan. Take your musical goal setting mind map and then branch out and brainstorm all your action steps that help you reach your goal. You’ll quickly have a visual representation of all the steps needed that you can tweak and adapt to your situation. Mind maps work great for teaching. First of all, you can create a somewhat ideal teaching plan that reminds you of all the important techniques and concepts you definitely want to convey to every student. I also create a mind map with a specific teaching plan based on the goals of the individual student. This gives me a lot of flexibility in quickly deciding what to tackle next with my student and also ensures that nothing falls through the cracks. How about creating your repertoire mind map? You can track the songs you’ve already mastered – develop set lists for your solo or band gigs – or write down song titles you want to learn in the future. The fancy new synthesizer, the vintage guitar, new software, useful and/or interesting books – store your wishes in a mind map. Spruce it up with colorful pictures and all the relevant background information like links to articles or the best deal on the net. When you have some money to spend, a mind map with all your wishes in front of you can help you to assess and prioritize your needs, so you don’t blow your money but rather make an investment into truly needed equipment instead. Personally, I don’t use mind mapping for my daily to do lists. There’s other, more specialized tools for that. What I like to create though are “Best Practice Checklists.” Whenever you have a recurring task, why not document the needed steps you take? It’s a pain in the a$§ to do – once. It can save you lots of time over the long haul and helps you prevent making mistakes by following your template. You could have a list with all the things you need to prepare and do for playing a successful gig – or, all the steps to back up your last recording session. Again, a mind map works great because all the resources like notes, links, files, etc… can be right in front of you, which helps to increase productivity. Track serial numbers, purchase and insurance information, warranties – all the equipment related information. What do I mean by toolbox? Create a mind map of all the tools of the trade. This could be a list of playing techniques on your instrument, it could be all the ways to voice a chord or a list of standard arranging techniques. The main idea is to have something to fall back to in case your mind draws a blank. You could be in a creative rut during an important production session with a serious deadline looming over your shoulder. Definitely not the best time for a creative dry spell. In such a situation a toolbox mind map could provide you with some ideas to try out. Often that initial spark is all that’s needed to jump start your creativity again. 1) If you haven’t already done so, download XMind and start your mind mapping! 2) The mind map I created for this post was featured at the XMind site. Feel free to download the file as a model/springboard for your own creations. Please leave a comment about your own mind mapping experiences. Do you find it useful? What kind of insights have you gained from mind mapping? Any other special uses that you’d like to share? Especially #9 the toolbox sounds interesting. I can see the mind map format working quite well for that purpose. Definitely try it out and list all your “tools” for specific situations in a mind map. Then you’ll have a reminder in place in case you scratch your head wondering what to do next.